To those of you who celebrate: Did you all have a good Christmas? Mine has been great, and it’s been lovely to have a week or so off to laze around and do absolutely nothing. Since I’ve been splitting my time between my parents’ house and my boyfriend’s parents’ house, I’ve eaten twice as many enormous home-cooked meals as usual – which is a lot. No complaints from me though, since it’s all been fab. Since January is just around the corner, I’ve started thinking about New Year’s Resolutions. One of my resolutions is always to eat more healthily – it doesn’t usually last too long, but I’d rather eat well for a couple of weeks and then give up than not bother trying at all. I hope you all like healthy recipes, because there might be a few coming up soon! Anyway, I figured I may as well practise lightening up recipes, so here’s my slightly healthier take on one of my faaavourite comfort foods – nachos! It’s pretty hard to beat tortilla chips smothered in masses of melty cheese, guacamole and fresh salsa, but these nacho roasted chickpeas were a very convincing alternative. If you want all of the flavours of an enormous pile of nachos, but with far more protein and far less fat, try this chickpea version. This dish was really easy to whip up, and didn’t take much time at all. 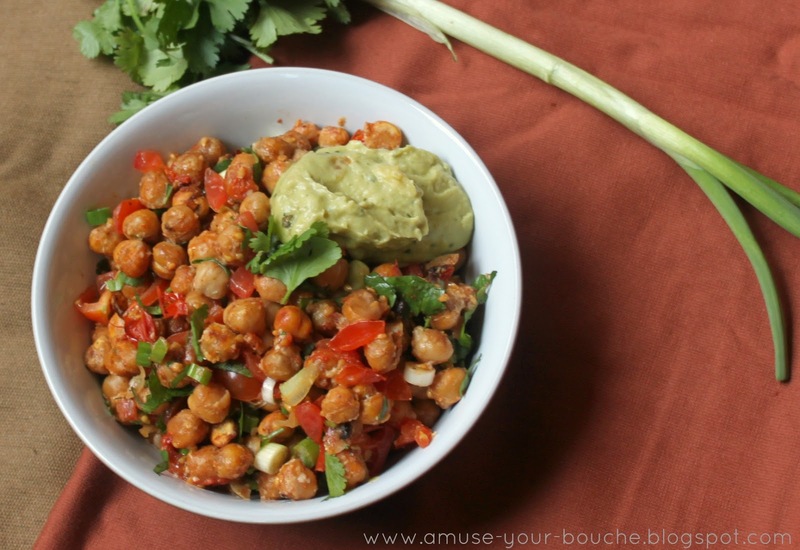 Just roast some spicy chickpeas along with a few tomatoes (since I never pass up an opportunity for roasted tomatoes), and then combine them with your typical nacho toppings – fresh coriander, spring onions, some more tomatoes (the ‘salsa’), and just a touch of cheese for authenticity. I served mine alongside some guacamole, since I don’t think nachos are complete without some avocado, but you could go for light sour cream too. I ate these straight out of the bowl (they’d be a great side dish for a Mexican banquet). However, if you’re not feeling as calorie-conscious as I am, or just want to make the recipe go further, you could try serving these spicy chickpeas inside a flour tortilla or some tacos, along with some salad leaves or more fresh herbs. A perfect, balanced vegetarian meal. In a bowl, combine the drained chickpeas with the fajita spice, oil and plenty of black pepper. Mix well. Lay them out evenly on a baking tray, in one layer if possible. Separate the tomatoes into two piles, and set one half aside. Take one half of the tomatoes (around 125g, but it doesn’t need to be accurate), and halve each tomato. 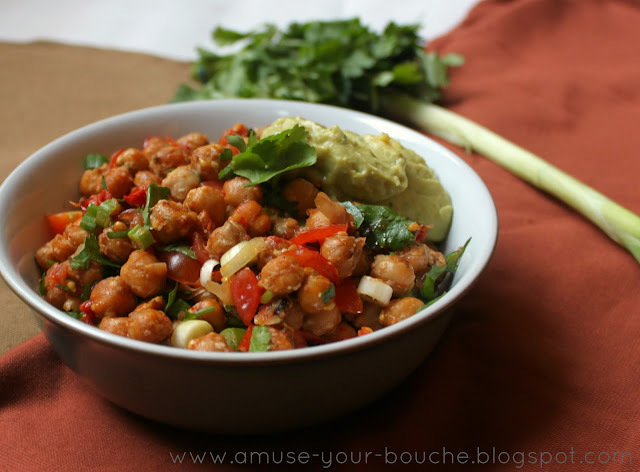 Nestle them amongst the chickpeas, and roast for around 30 minutes, stirring halfway. While the chickpeas and tomatoes are roasting, prepare the vegetables and grate the cheese. Roughly chop the coriander, slice the spring onions, and finely dice the remaining tomatoes. When the chickpeas have finished roasting, transfer them to a large bowl, and add the cheese, followed by the tomatoes, spring onions and coriander. Mix well, and serve immediately, with guacamole or sour cream if desired. I got all the ingredients to make this tonight but have one question. When roasting the chickpeas do they get hard ? Hi Laura, it depends how long you roast them for really! Sometimes roasted chickpeas get nice and crunchy, but if you prefer, you can cook them a little less so they’re still slightly soft. In this particular recipe, the coating stops them from getting super crunchy, but again you can roast them for as long or as little as you like really! Enjoy! Sounds great and very healthy!!! Pinning!!! Ooh, this sounds great! 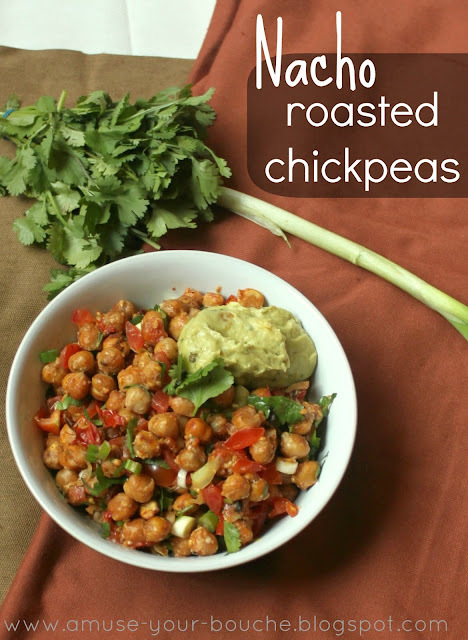 I love Mexican food, and have recently discovered roast chickpeas – this is a great combination! Congrats on the Top 9! this is the PERFECT vegetarian mexican dish! it has all the flavors, and still full of protein without the meat. mmmm!